In the second of our two blogs looking at how increased provision for active travel to the area might affect local businesses, particularly in relation to Byres Road, GoBike members continue to examine the economic benefits that come with providing safe space for active travel. Big changes are afoot on Byres Road. But big changes bring uncertainty – and one particular area for discussion has been how introducing segregated cycle lanes might affect local shops, cafes, and restaurants. Here, GoBike aims to clear up a few common myths by summarising the existing evidence about business and bikes. Myth number 1. People arriving by car account for the majority of shoppers. It’s easy to over-estimate how reliant shopping streets are on vehicle traffic – partly because so many of those streets are currently dominated by cars. For instance, retailers in Bristol thought that almost twice as many of their customers had arrived by car as was actually the case (41% vs 22%) (1). The same goes for distance travelled – traders guessed that 40% of customers lived more than two miles away, whereas in reality it was 14%. These findings have been replicated in cities in Ireland, Austria, and the Netherlands, with the consistent conclusion that most customers are local, and not reliant on cars (2). The same is true for Glasgow. In a recent survey, 69% of shoppers on Byres Road arrived by walking or cycling (40%) or public transport (29%) (3). So local customers arriving by active travel are definitely the mainstay of local business revenue – despite the fact many people currently find Byres Road an unwelcoming place to walk and cycle (4) (see below). Imagine how much more they could contribute to the local economy when Byres Road is designed with people – rather than cars – in mind. Myth number 2. People arriving by car spend more. There’s evidence from the UK, Ireland, Canada, Australia, Denmark, and the US that people who walk or cycle spend as much or more in local businesses than those who arrive by car – usually because they spend less per shopping trip, but shop more often (2, 5, 6). The same goes for people using public transport. This makes some intuitive sense: the great advantage of walking and cycling is its spontaneity. Without needing to wait or circle for ages to find a parking space, or to worry about when the meter runs out, people are encouraged to pop in, to browse, to discover. On Byres Road, people walking or cycling generate more of the monthly retail spend on Byres Road than those arriving by car – especially during university term-time, when there’s an almost seven-fold difference (3). And that’s with current levels of active travel provision, which most visitors and residents think is poor (4). Click here for a detailed breakdown of how a more efficient use of space could substantially increase footfall on Byres Road. Myth number 3. Parking availability is an important factor in where people choose to shop. Several studies in Edinburgh, Leicester, London and abroad have found that people’s decision where to shop is more likely to be influenced by the range of shops, prices, and how pleasant the area is, rather than by parking (6,7). In fact, “less traffic” is often mentioned as a priority for improvement. Mary Portas’ review about revitalising the high street found that “in order to be places that people want to visit, high streets need to be accessible, attractive and safe”, and highlighted “busy roads” and “small, cluttered pavements” as discouraging to visitors (8). Yet the solution isn’t automatically more parking (as that review contradicted itself by recommending) – in the studies described above, parking provision was found to have little if any impact on trading success. Instead, the key is to create pleasant places where people want to visit, linger, and return. The same goes for Byres Road. People surveyed in the area as part of the council’s recent placemaking project consistently identified “the dominance of traffic and car parking spaces” as having the greatest negative impact on the appearance and feel of the street (4). Poor air quality was also highlighted as a major factor in people’s experience of the area, and cycling was found to be “neither easy nor pleasant”. That report concluded that there was a need to redress the balance between traffic, parking and active/public transport to create a more “people friendly street”. Myth number 4. Initiatives in other cities to provide bike lanes in busy shopping streets and town centres have been unpopular and unsuccessful. Globally, there are a wealth of case studies showing that new bike lanes have had either a positive or neutral impact on local businesses (9,10). A review of such research from Canada and the US found that this is particularly likely to be the case in “walkable urban cores” (translation: places like Byres Road) (11). There’s also a growing number of local business owners who have gone from critics to converts, after seeing the benefits of bike lanes to their streets: here are just a couple of examples from Newcastle, the city of Calgary in Canada, and Salt Lake City in the US. 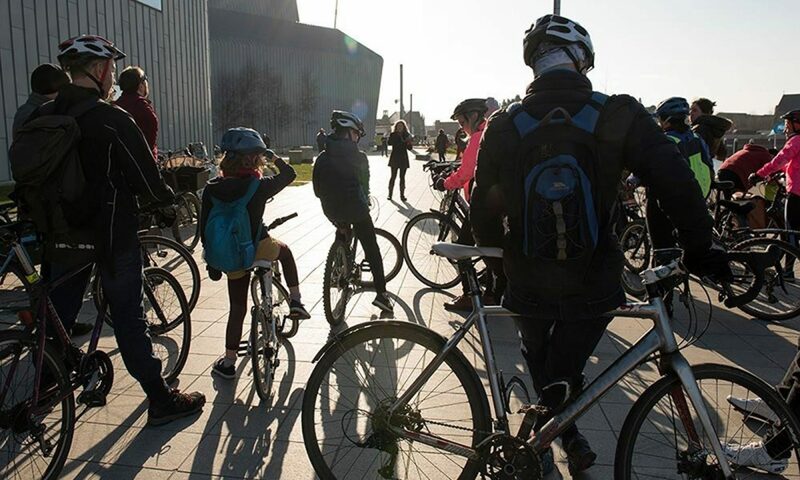 In London, more than 180 companies have joined a coalition to campaign for better cycling infrastructure, in recognition that bikes are good for business. Businesses also stand to benefit when their employees make use of improved walking and cycling infrastructure. People who cycle to work on average take less sick leave, saving UK businesses almost £83 million each year (5). And there’s no doubt about demand from the public. A survey in seven UK cities found that 78% of people supported building more protected cycling infrastructure, even if it meant less space for other road traffic (12). The consultation on the plans for Byres Road showed strong support for a more ambitious vision for active travel, with 44% of respondents raising concerns about the quality of the proposed cycling infrastructure (13). Of course, some parking is always going to be required, particularly for people with disabilities. But through careful redesign, reductions in general parking offer an opportunity to improve equity of access, by ensuring that a greater proportion of parking provision is given over to disabled bays. The same goes for loading and unloading: better to have dedicated spaces reserved for businesses than be competing with customers for space or doing a stressful double-park. Myth number 5. It won’t work on Byres Road – those studies were done in other cities and don’t apply here. It’s true that sometimes research from one context doesn’t always translate to another. But as we’ve demonstrated for each myth above, in this case we’ve got plenty of evidence of our own. We know that a whopping two-thirds of the population in the UK would like to cycle but just don’t feel safe doing so (14). Results from the Scottish Household Survey suggest that the number and speed of cars are key factors (15). Women, families with young children, and older people are particularly affected by a lack of protected cycling routes (16). At the moment, most people visiting and shopping on Byres Road are local, and travel using active or public transport. This group accounts for the majority of business income, especially during the peak term-time periods. Yet how do we reward these loyal big-spenders? Narrow uneven pavements, cluttered streets, no safe cycling routes – as they’ve consistently told us through placemaking projects, shopper surveys, and consultation feedback. They’ve told us that the dominance of cars is the worst thing about the Byres Road experience. Let’s take this opportunity to change that. Portas (2011). The Portas Review: An independent review into the future of our high streets. https://assets.publishing.service.gov.uk/government/uploads/system/uploads/attachment_data/file/6292/2081646.pdf . Previous PostPrevious Is Parking really so good for Business? Next PostNext Consultation Digest Issue 22, 20 November 2018: A bumper bundle of new consultations.